Glowing lights don't turn a gadget or garment into wearable tech, as fashion designers and art students have learned the hard way. But a pair of smart headphones that pulses to the rhythm of the music you're playing on your smartphone? Now we're listening. Glow is the first pair of smart headphones with a pulsing laser illuminated cable which reacts to the music you're playing. If the project reaches its Kickstarter campaign's stretch goals the lights will pulse to the beat of your steps, movement and even your heart. That doesn't mean this is a fitness wearable - we've seen a fair few fitness headphones come out of CES from the Bragi Dash earbuds to Parrot's Zik Sport to Sony's Smart B-Trainer. 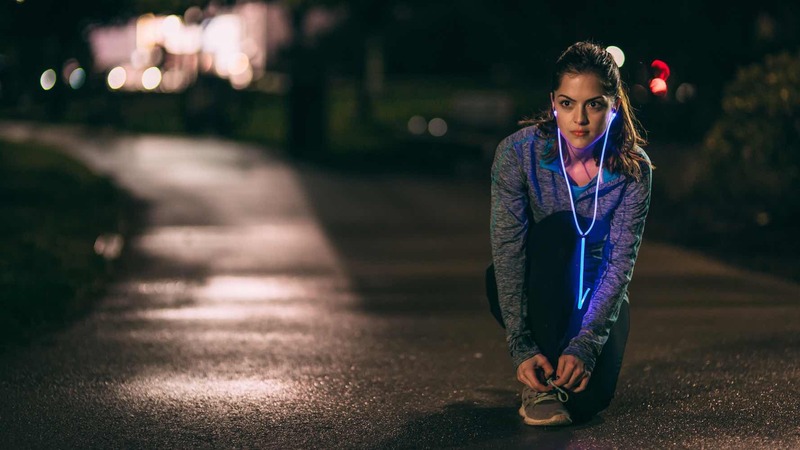 Glow fits into more of the fashion and lifestyle category - the headphones come in three colours: red, blue and green and once you pick you can't alter the hues. The tech behind is Corning's Fibrance light-diffusing fiber: a glass, optical fiber that's thin, flexible, bright and colourful. The glowing thread was announced by the company behind Gorilla Glass in 2014 and Glow is one of the first gadgets we've seen use the technology in wearable tech. The in-ears also feature an in-line five way d-pad, made from soft polycarbonate to give Android users similar controls to what iPhone users have enjoyed for years on their headphones - answering calls, sending canned responses to texts, activating voice controls and snapping pics via the smartphone camera. So Glow is practical as well as futuristic. If the Kickstarter campaign hits $500,000 the team will add full iPhone support but it's clearly not their priority - Apple's smartphone has plenty of accessories that work perfectly with it. If it hits $750,000 they will add functionality which uses your phone's accelerometer to make the headphones pulse to steps and movement, $1m and the headphones get a built in heart rate monitor. There's still Glow units left to buy at the early bird Kickstarter price of $127. Glow has already raised $25,000 of its $100,000 target with 44 days to go and the campaign ends on 13 March.